I can't even believe May is almost here. Time just flies in spring! This might just be my favorite time of year to teach kindergarten. In nine short months, my kinder cuties have gone from not being able to recognize the first letter in their name, to READING! This never fails to amaze me. Not only that, but they are little writers and authors, they can add and subtract, write their numbers to 20 (if not more!) and plus they are just sweet little problem solvers. Their brains are little sponges, and I just love that they love to learn! Scroll through this post to see what we are up to this month and grab a few fun FREEBIES to try with your class! 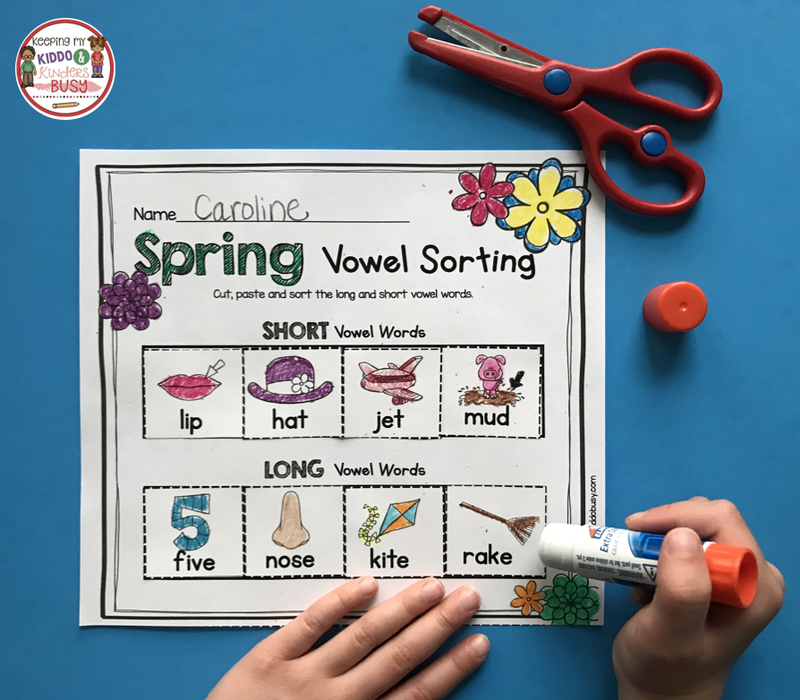 We are in full swing tackling the standards… mastering our sight words, solidifying CVC words, learning all about sequencing and practicing comprehension skills. We are becoming writers and authors, being number wizards (they have gotten so good with teen numbers since January! ), learning how to add and subtract within 10, more than/less than, and getting fluent with sums of 5. PLUS… SO much more! Plus, we are now learning beginning blends, digraphs, and long vowels! By now, my students have mastered rhyming and syllables, but I still include these practice pages in every one of my monthly no prep packs. I also always include a monthly writing prompt, “I see” monthly booklets (emergent readers), a goal setting sheet and labeling practice. My students like the routine of these pages. We set goals every month, and I keep them in a portfolio for parents at the end of the year. It is an awesome way to document their progress! I do the same with their writing prompts.My kiddos have been reading and writing CVC words all Spring, and now we are tackling word families! I find this really helps with their automaticity and fluency. These activities are great for fast finishers, literacy centers or even whole group. My kiddos love the mystery word sentences. They have to read the sentence, look at the picture and use the word bank clues to fill in the missing word. I have them work with a partner on this. This month we are working on long and short vowels, and adding the silent -e! To help my students new master sight words, I use the same three tools for each word. Using this same approach every month saves me so much time in explaining the expectations and directions for this activity. I have them trained in exactly what is expected and they love the routine! All the work is done for you! For both of these activities, we start whole group. I read it aloud first, then we choral read the passages together and then they buddy read with the partner sitting next to them. If you have your kiddos make a Mother's Day Card, there is one included in this pack! There is also a cute "All About My Mom" page that is so adorable to watch them fill out. I love to see what they write about their moms, and it makes an adorable keepsake if you laminate them. Every month comes with worksheets addressing 2D and 3d shapes, numbers 1-10, ordering by size, etc. In math this month, we are practicing ways to make ten and numbers 11-20… the teen numbers! We started teen numbers in January, and most of my students understand them now. These worksheets are great practice using ten frames and number lines. We always review counting by 5's, 10's, counting on and story problems. Counting how many with teen numbers can be tricky. Students can forget which objects they count and get confused. I try to have them start with TEN, and simply count up from there. For example... 10, 11, 12, 13! More than/Less than is always a tricky concept for kids. I always include number lines for references. I teach my students to always find the numbers on the number line, and then they can answer the question. Two activity pages are included – one for 1-10 and one for 11-20. ★ Sequencing - two activities! Everything is Common Core aligned and ready to teach! Activities are fun and engaging for students. Perfect for direct instruction, small groups, homework, fast finisher tubs, sub folders, and more!